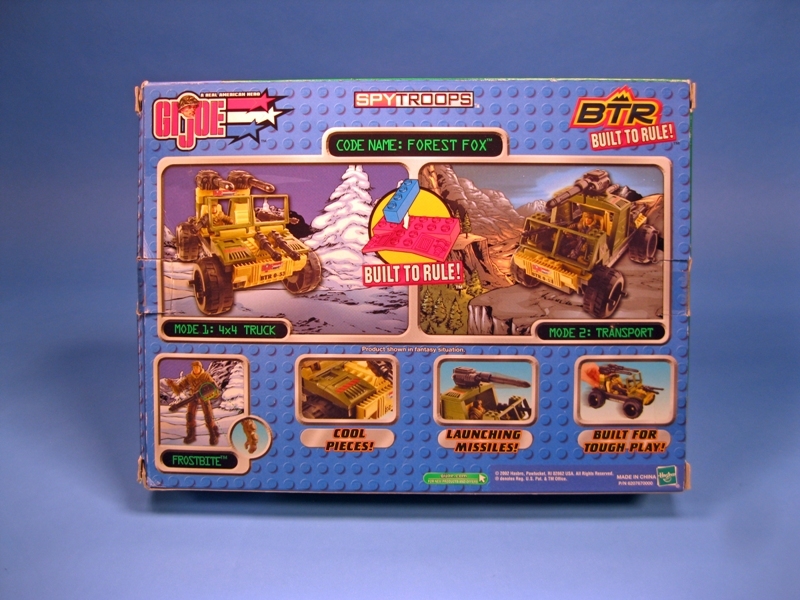 The Built to Rule Forest Fox, available as part of the first series of BTR sets released in 2003, is a utility attack vehicle set for the G.I. Joe team. 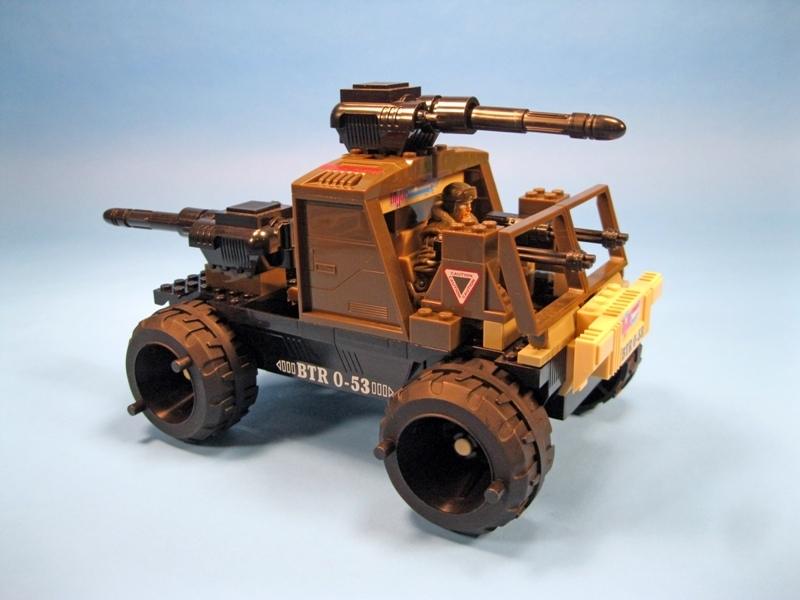 In its primary mode, the Forest Fox is a general-purpose attack vehicle that seats two figures in the cab, with standing room for more in the back. It’s no surprise for such a universally useful category of vehicle that the G.I. Joe motor pool is overflowing with workhorses such as the Official G.I. 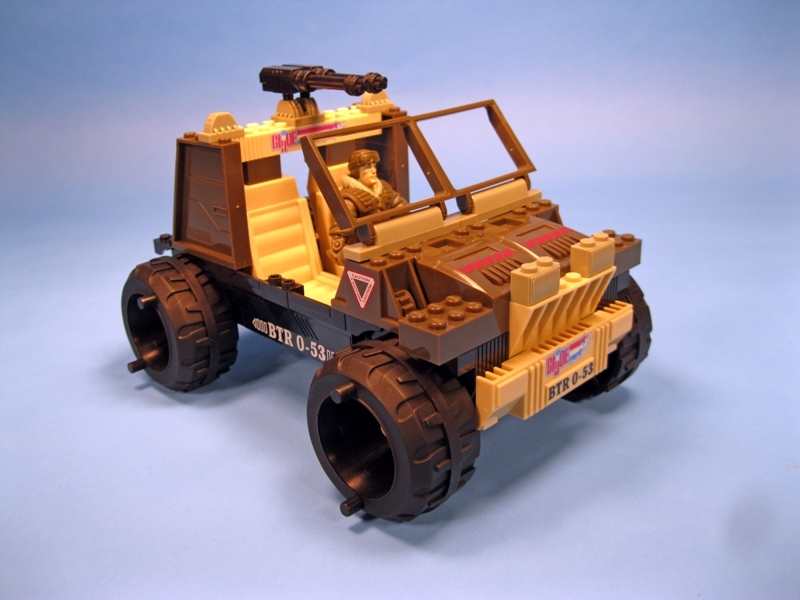 Joe Jeep of 1965, the 1982 VAMP, the Desert Fox of 1988, 1990’s Hammer, the Mudbuster of 1993, The MUV, Smokescreen Transport, and Split Fire of 2003, the Jungle Strike Humvee of 2004, the Desert Strike and Night Ops Humvees of 2005, The Pursuit of Cobra Vamp released in 2010 and again in 2011 as part of the 30th Anniversary line, and yet again, with additional parts, in 2012 as the Retaliation line’s Ninja Combat cruiser. The iconic VAMP, the favorite in this class for many, and the larger 1990 Hammer have both seen additional, modified releases later in the line. The included figure is arctic special operations commander Frostbite. The figure is based on his 2002 G.I. 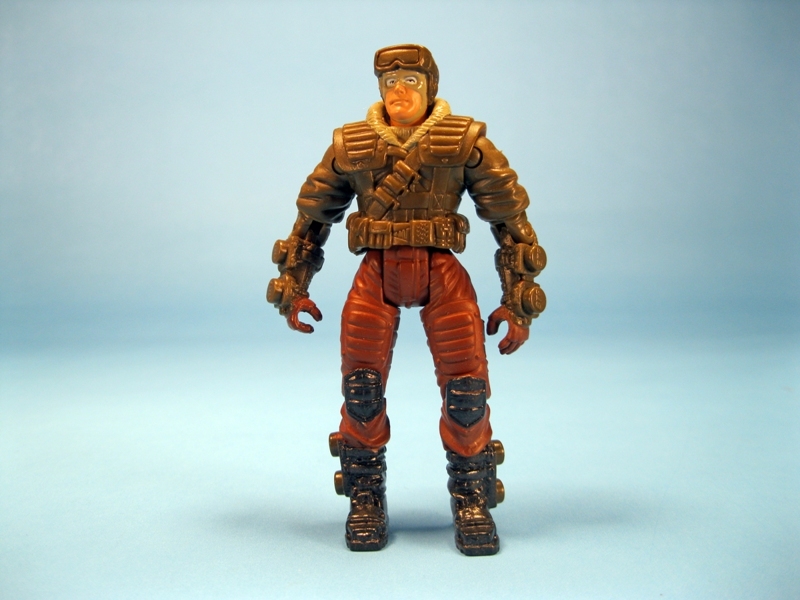 Joe vs. Cobra appearance, including the bulky proportions and t-crotch construction introduced briefly during that line and shared with the BTR version of Wet-Suit. In keeping with the woodland operations theme of the set, Frostbite’s uniform is toned down from his usual arctic white. 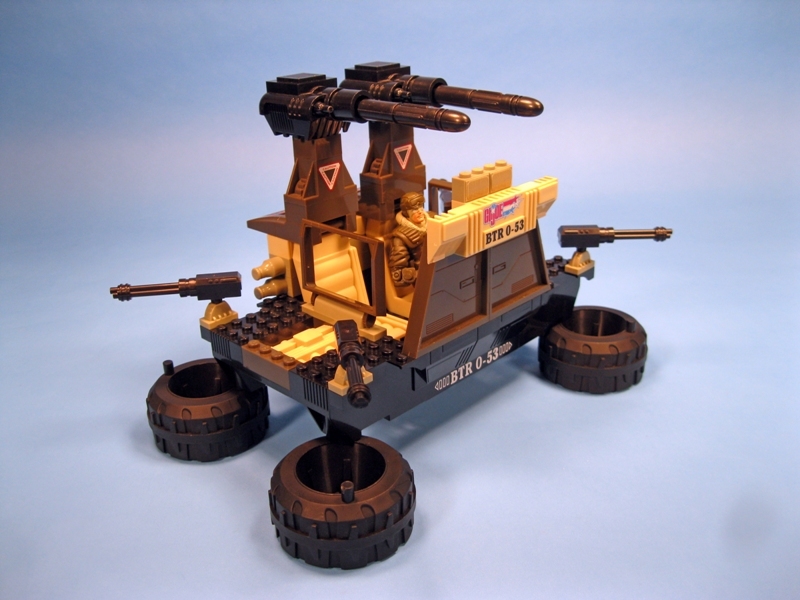 The set’s secondary mode is described as a transport, featuring a cab-forward design and an open cargo area in the back. 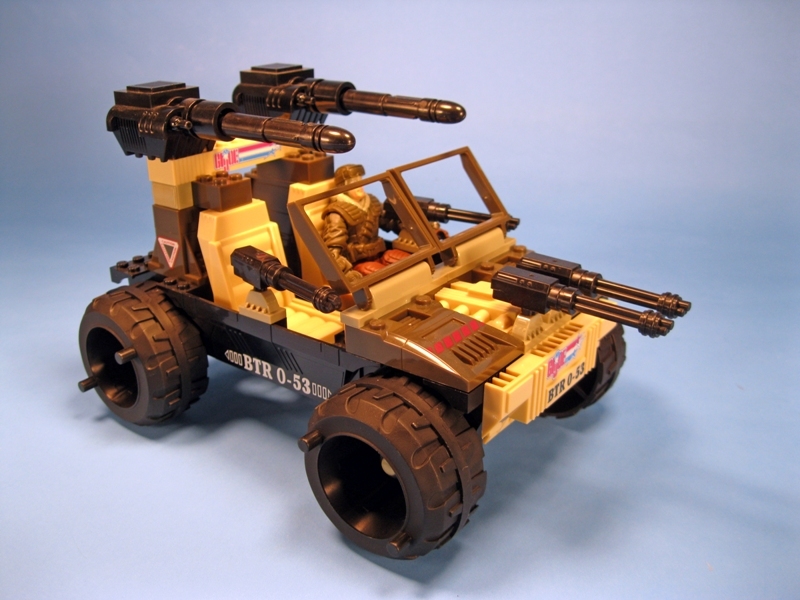 The Forest Fox’s weapons complement consists of a pair of the ubiquitous BTR missile launcher and four of the standard BTR miniguns with mounts. 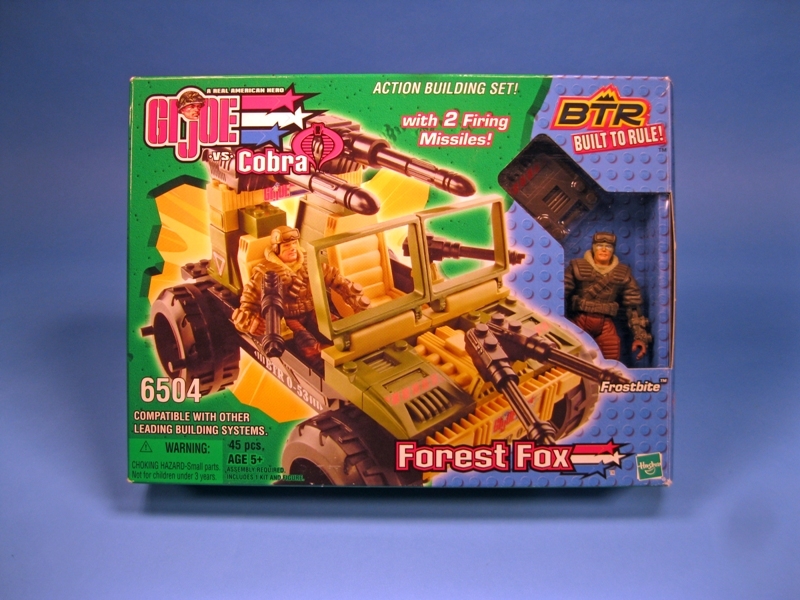 Some of the notable parts from the Forest Fox include the black chassis piece, the windshield pieces, the fenders, and a pair of tan grille/bumper pieces. Bricks with printed G.I. Joe graphics add useful bits of color and decoration to the set. 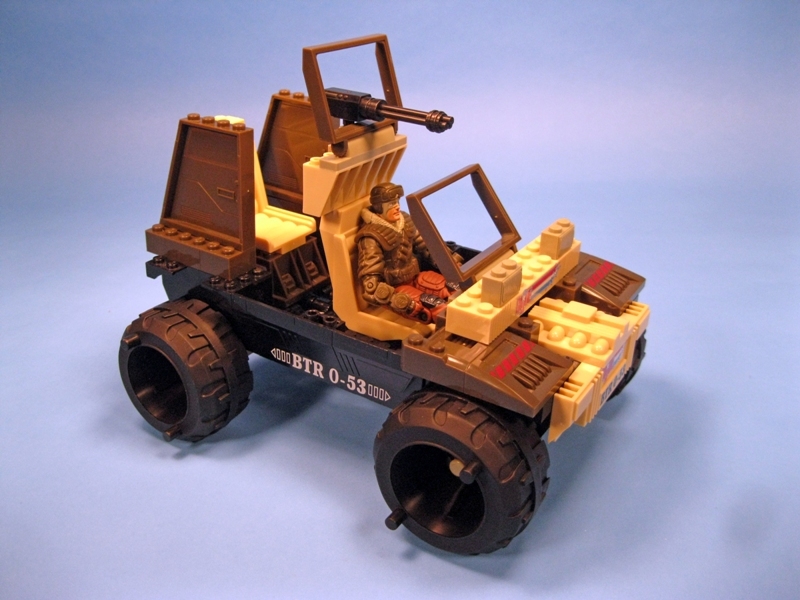 With their face-mounted studs, the standard BTR wheels can be rotated flat and attached in equally useful roles as supports for a stationary base or hover skirts for a moving vehicle. Those knee pads on Frostbite look like those of the 2002 Flint–I bet this figure would look interesting with repainted versions of those same lower legs swapped in, and the lower arms with those of the green ’02 Frostbite. Not a bad looking vehicle at all. As a fan of Frostbite, I’m not really into this figure. Maybe if it had a different head sculpt, paint scheme, and got rid of those Lego attachments on the actual figure. 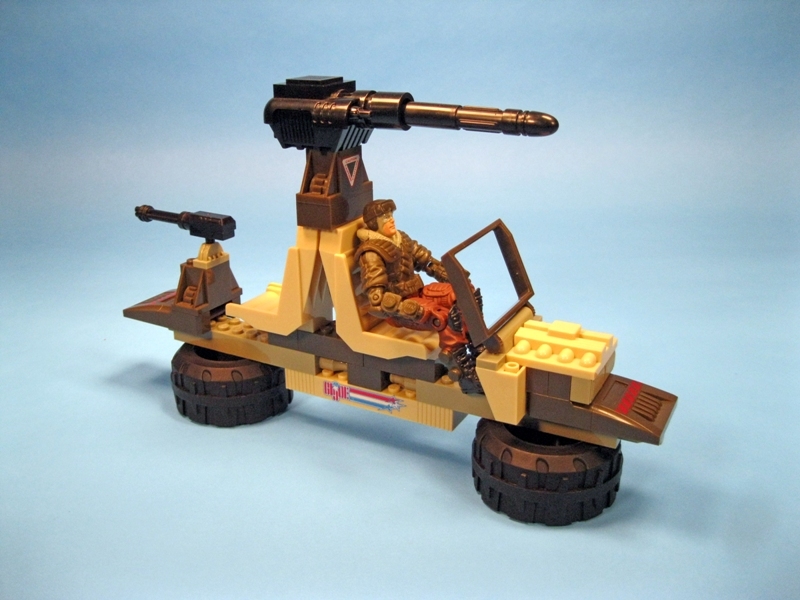 This set had shelf space as it was the only Joe vehicle i could find at the time. Now its in the same bin as all the “non” Lego. Oh crap–it’s April Fool’s Day tomorrow!! The unicorn avatars were a dead giveaway!